I think thats a brilliant idea Lynda , Mandy. This is a great idea Lynda as i have loads!! I will start if thats ok with this lovely chestnut boy ? anyone? no im not having a senior moment there where no pics earlier!! Flo I have no idea who this horse is perhaps you can help by saying where you got the picture from? Sorry Lynda i have not a clue!! I will try and re trace some steps where i am likwly to of been in the past 2 years !! will let you no if i find out!! I found him by saving your pic, and the file told me his name! You had it there all the time!! Oh clever girl Bia, I would never have thought of that. you may have solved the problem of lost horses! but how are you going to find my horse? Not clever at all Lynda.. just my pure Luck! I still struggle with your horse.. have looked through almost all 'Fotki' albums of American horses..phew! I'm stuck!! I don't understand how this quiz is different from the other one, if the poster of the photo knows who the horse is? When I first looked I assumed it was if you had a photo and didn't know who it was of? 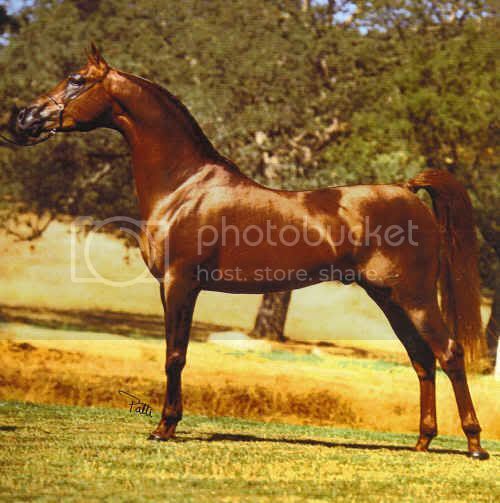 The brown horse - is he Mizan Taj Halim or Arnette Perlane? No books to look them up in! Yes it is Arnette Perlane, well done, did you recognise him? Ralvon Elijah was 2nd to Mizan Taj Halim when he won the World Championship in 1983. I"ve only seen pics of Arnette Perlane - but that head!! Never forgotten. yes I agree is'nt he almost perfect!